Character period 5 bedroom home with full sized pool in great location. 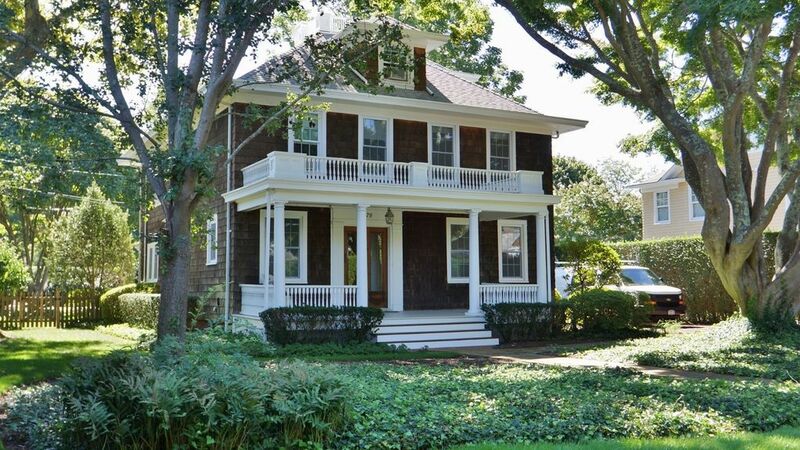 Traditional 1903 clapboard village house available for rental from August or year round. 5 bedrooms, 3 and a half baths, well maintained heated pool, patio for outside eating with gas barbecue. Central A/C ground floor and window units above. Recently refurbished. Walking distance from both uncrowded Little Plains beach (for cars a village permit is required, so peaceful and unoccupied) and Southampton village's wonderful shops and restaurants. The house has been refurbished recently, but the layout was unchanged. It is fronted by a huge, beautiful japanese maple. The back has an inviting swimming pool and plenty of patio space for outdoor eating. The basement has a ping pong table. This is a special house that is family friendly and much loved. If you would like to know more please contact me. From New York. Grew up using this house. Based in London now, with a caretaker in the Hamptons near the property. My parents bought this house in 1983. It is unique--a very tasteful village property in a fabulous location (walk or bike to the beach, pond or village). A traditional family that house touches a lot of people. The location is ideal, particularly for children. Apart from the beach and pool, there are 2 playgrounds in the village, a big library with a wonderful children's section, and 3 candy stores... 5 minutes walk away are Sip 'n' Soda, my children's favourite diner with fabulous ice cream sodas, and La Parmigiana, for great pizza or an old fashioned Italian sit down dinner where one plate could feed 3 people with leftovers. Dining room with long table. Extra seats can be added. We had such an amazing week in Southampton in this immaculate house. Susan was a pleasure to rent from, she was very quick to respond to all our questions! We very much hope to rent this house again! Easy walk to beach, shops, restaurants, playgrounds and even hospital. Off road car parking. The property is also available for year round rental. The year round rate is £65,000, and the tenant pays utilities, lawn care, pool maintenance and cleaning separately. There is a £150 per week cleaning fee for all bookings, except year round bookings.